AUSTIN – The Texas Department of Public Safety (DPS) today highlighted notable traffic and driver license laws that go into effect on Sept. 1, 2015 (unless otherwise indicated). Please note that the following is not a comprehensive list of all new laws passed by the Texas Legislature. SB 1918 amends current statute to authorize the use of LED ground-effect lighting equipment on a motorcycle. In accordance with this provision, such lighting is only permissible if it illuminates the body or ground below a motorcycle, and if it emits a non-flashing amber or white light. These limitations are designed to ensure the LED lights are not mistaken as the flashing lights of an emergency vehicle. SB 1934 amends current statute to require social security numbers or proof that the applicant is not eligible for a social security number for all personal identification card issuances. It also limits the issuance of one Texas driver license or ID card per person and discontinues the issuance of no-expire ID cards for persons age 60 or older. HB 2246 amends current statute to require a judge to restrict any person whose license has been suspended after the conviction of an intoxication offense to the operation of a motor vehicle equipped with an ignition interlock device. Once suspended for the intoxication-related offense, a defendant may only operate a motor vehicle during the suspension period if an ignition interlock device is obtained and an occupational driver license is issued with the proper designation. The bill also requires the court to order the ignition interlock device to remain installed for the duration of the suspension, instead of the prior requirement of at least half of the suspension period. The applicable offenses include driving while intoxicated, driving while intoxicated with a child passenger, flying while intoxicated, boating while intoxicated, assembling or operating an amusement ride while intoxicated, intoxication assault or intoxication manslaughter. Don't Wait. Communicate. Make Your Emergency Plan Today. (Harris County, TX) – Harris County Commissioners Court recognized September as National Preparedness Month (NPM) and the Harris County Office of Homeland Security & Emergency Management (HCOHSEM) encourages residents to take time to make sure that their families, neighborhoods, and communities are prepared for disasters and emergencies of all types. "Severe weather and other emergencies can strike with little or no warning and can have disastrous impacts," said Harris County Judge Ed Emmett. "Residents, especially those new to our area, need to be aware of our local hazards and take steps to prepare." HCOHSEM is promoting emergency preparedness through its newly produced public service announcements, on its website www.readyharris.org, and through social media www.facebook.com/hcohsem and www.twitter.com/hcohsem. "Being prepared is a shared responsibility and everyone should do their part," added Emmett. "Emergencies will happen, so it's important to be proactive and get prepared before disasters strike." Last year, HCOHSEM participated in more than 200 outreach events and distributed thousands of preparedness brochures and other preparedness items in multiple languages. Harris County is committed to maximizing awareness and encouraging participation in disaster preparedness training and activities. HCOHSEM provides preparedness guides and emergency news and updates at www.readyharris.org. More details about NPM and the Ready Campaign are available at www.ready.gov or by calling 1-800-BE-READY, 1-888-SE-LISTO or TTY 1-800-462-7585. This Food Fair will bring fresh produce, bread and pastry, and assorted grocery products to this location to help those in need of food. Harris County Releases New PSAs in Time for National Preparedness Month We're Prepared, Are You? (Harris County, Texas) – The Harris County Office of Homeland Security & Emergency Management (HCOHSEM) has released two new disaster preparedness public service announcements (PSAs). "The PSAs are part of Harris County’s ongoing public awareness campaign to encourage residents to be disaster prepared," said Harris County Judge Ed Emmett. "Our area is not immune to natural or manmade disasters, so we are committed to reminding our residents to be prepared for all types of emergencies." The disaster preparedness PSAs were produced in the Harris County Emergency Operations Center and remind residents that they cannot control when a crisis will strike, but they can prepare. The PSAs show various emergency situations and end with the catchy tagline – We're prepared, are you? HCOHSEM is distributing the new 15 and 30-second spots, in both English and Spanish, to local media and emergency management partners. The PSAs will also be posted on YouTube at www.youtube.com/user/HCOHSEM. "Harris County works year round to educate and prepare our residents through PSAs, outreach events, publications and other materials,” added Emmett. “But it’s up to each individual follow through with their own disaster plan." HCOHSEM released its hurricane preparedness PSAs this summer urging residents to be prepared during hurricane season, which runs through November 30th. The disaster preparedness PSAs have been released in time for National Preparedness Month which runs through the end of September. Residents can stay informed about area emergencies through HCOHSEM's Facebook and Twitter accounts, and at www.readyharris.org. With extreme heat conditions, we are beginning to see jurisdiction responses throughout the Region and Harris County. Listed below are just a few that you may or may not be aware of happening. If I missed anything, please let me know and I will pass along the updates. Thanks for your continued heat and fire safety awareness and preparedness. Montgomery County Commissioners moments ago instituted a BURN BAN for Montgomery County. This is in effect until further notice. More than half of Montgomery County is now in the 700-800 KBI Index. This is very close to where we were during the wildfires of 2011. Just an afternoon shower will not ease this as the the tops of the grass and brush will remain dry as the water is quickly absorbed. The forecast for the next two weeks is even worse as the KBI Index increases. In response to the increased risk of outdoor fire, the Harris County Commissioners' Court has enacted restrictions on uncontained burning. The burn restrictions require the use of covered burn containers for the incineration of household trash, vegetation, and campfires. Permitted burning activities such as training fires, prescribed burns, and ceremonial fires are unaffected by today's action. Violation of the burn ban is class C misdemeanor. 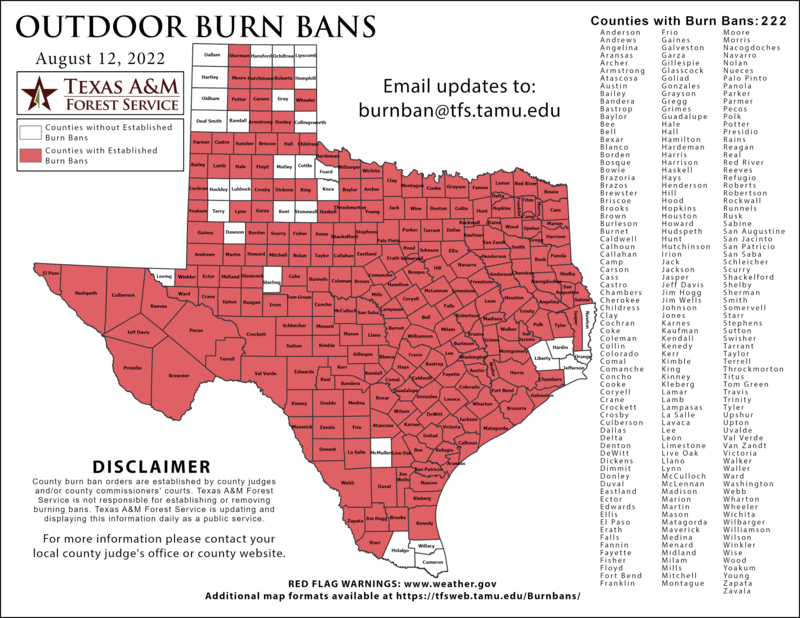 "While this is a precautionary restriction and not a total burn ban, residents should not discount the growing fire risk in the county," said Harris County Fire Marshal Mike Montgomery. "By taking protective measures now, we can reduce the risk of wildfires as we head into the late summer." Montgomery urges residents to postpone outdoor burning until its cooler and there is more moisture in the air, and to keep all fires attended, with a water hose or other means to keep a fire from escaping or spreading. Montgomery emphasized that residents should report unattended fires immediately by calling 9-1-1. Even a small fire can spread quickly, and as our area continues to dry out, heavier fuels such as trees and downed timber can be ignited more easily, and take more effort to extinguish. The Keetch Byram Drought Index (KBDI) has increased over the past month, peaking today at an average of 677, with some areas as high as 722. The KBDI measures rainfall deficits on a scale of 1-800 with 800 being the worst case, representing a need for approximately eight inches of rain to fully saturate the ground. Any reading above 600 represents higher fire danger, while readings of 700 or more represent very high to extreme fire danger. For more information online about outdoor burning restrictions, please visit our website: www.hcfmo.net. Wildfire safety tips are available from Texas Forest Service. MADD Southeast Texas will be hosting a Power of Parents Facilitators Training on Wednesday, August 26, 2015. We would like for you to come out to be trained in this worthwhile program to help combat the problem of underage drinking. . After being trained, facilitators will be able to reach out to community groups and organizations to present the Power of Parents curriculum. Please see the attached flyer for details about the training. Space is limited so please RSVP no later than Friday, August 21st. We hope to see you there!! You can learn more about Power of Parents at http://www.madd.org/powerofparents. I hope you are all doing well and staying hydrated in this heat! I wanted to let you know that HAAM will be having a mobile Food Fair this Thursday, August 13 here in Summerwood. This is an event for those who are in need of food to drive thru and pick up a bag of FREE food. It is open to anyone in the community, regardless of their status. Please help to spread the word to your congregation members and those you help who are in need. It is being advertised at HAAM, and on community Facebook pages for FC, SW, ES, and HKA (Humble, Kingwood, Atascocita). I am attaching a flyer in English and Spanish as well. We will also be collecting back to school supplies for HAAM at this event. However, no donation is necessary to receive a bag of food. ©2019 by Community Response Task Force. All rights reserved.